Since we live in Colorado, a state known for its various outdoor activities. Many of us use our vehicles for mountain driving or towing a trailer. These extreme driving conditions will make an automatic transmission work even harder than usual. It’s important to schedule an automatic transmission flush as a part of your vehicle’s maintenance schedule. Your automatic transmission creates an enormous amount of heat because of all the friction created within its parts. Every time your transmission shifts up and down and with every start and stop, it is generating more and more heat. In today’s transmissions, there are a number of electronic components necessary in order to keep the transmission operating properly. 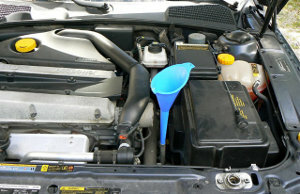 Transmission fluid is also needed to reduce the heat that is produced by these components when the vehicle is running. Low levels or dirty transmission fluid can clog the components and the tight spaces in its interior. It doesn’t take the automatic transmission fluid long to heat up even under normal driving conditions, so towing a trailer, mountain driving, stop and go city driving, or trying to get your car out of a snowbank, will make your transmission work even harder. This causes the fluid to overheat, break down and oxidize. Transmission fluid that is oxidized turns brown and can smell like burnt toast. Excessive heat will destroy the transmission fluids ability to lubricate or reduce friction and will ultimately cause damage to components. This is the main reason why car manufacturers and auto repair shops recommend an automatic transmission flush every 30,000 miles–more often if you use your vehicle for frequent towing. Transmission flush is really essential after certain time interval to prolong the lifespan of the transmission. Transmission fluid acts as a lubricant and reduces friction among different components of the transmission. However, it degrades in time and could not reduce friction in an effective way. Apart from this clogged transmission could not work effectively. So, transmission flush is really essential to remove dirt and prolong the lifespan of the transmission.